Bill knew he was going to need some major motivation in order to walk that many miles. Then he had a thought. “What if, during my walks, I think of the people in Haiti, and especially the children of St. Joseph Family Homes, whose lives have been so devastated by the recent earthquake? Better yet, why don’t I walk to raise funds for their ‘resurrection from the rubble’?” And that is what he decided to do. 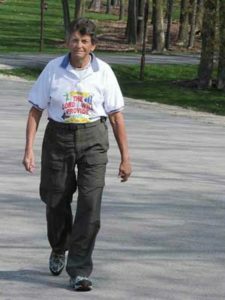 From April 16th to May 15th, he challenged himself to walk nine miles each day, using a pedometer and keeping a log of his miles walked. Pledges per mile and for set dollar amounts were accepted. His walk was a huge success. Bill walked 270.9 miles in those thirty days, and raised a total of $4,156 for St. Joseph Family Homes in Haiti. And, two weeks after the completion of his walk, Bill’s surgeon told him the healing of his spinal fusion was six weeks ahead of schedule! Praise the Lord! !